The forest lay in a broad river valley. We descended from the town along a trail, and found a large encampment of gers that sprawled into the distance along both sides of the riverbank. This was the village of Terelj. Dogs came up barking at the strange horse and rider, hard men stared with stone faces. Women walked hurriedly out of the way as I approached. This was the way of cities and towns. Distrust of strangers. In the countryside, I hoped it would be the opposite. 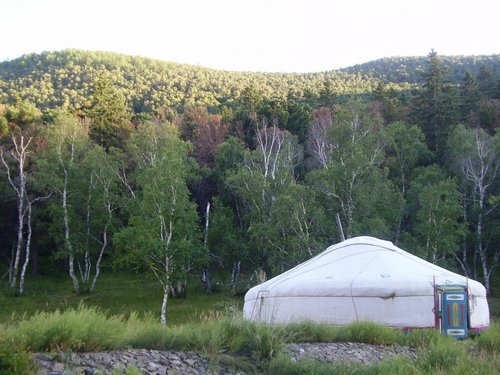 We came up to the long wide river, one of the main tributaries of the Tuul. Rocky balked at the edge. The stones looked slick, the river was fairly deep, and he was overburdened. I got off and led him across. Halfway through, the water crested over my thick Mongolian riding boots and flooded. Doh!! I finished crossing against the fairly strong current, soaked. What an idiot! If I had ridden across, I would have stayed dry. After hitching Rocky to a tree, I sat down and poured out my boots. I heard a laugh. Two other horse-riders stood a little ways down the path. They had probably watched the whole episode. They said something in Klingon and laughed again, then trotted off. I squeezed my socks as dry as I could, put back on the boots, and got back underway. I hadn’t even gotten out of town yet and was already a joke. Soon, the gers grew sparse and the dirt road grew grassy. The main trail led up out the forest to the foothills. I thought about Katarina’s story and others. How horse thieves were always looking for a lone tourist. If I went up to those exposed hills, I would be seen by anyone who cared to look. If I stayed along the river in the forest, I would be out of the sun in the pleasant shade, near water, and hidden from sight. A narrow trail that followed the river branched off the main road. We took it. The dirt was firm, the air was cool, the riding pleasant. Fun at last! I managed to get Rocky to trot, and we bopped along down the trail. Sunbeams danced through the trees, creating golden fairies from the pollen and dust. The play of light and shadow, the cool air from the river, the thrill of finally setting off on something new; it all combined to give me a sudden, overwhelming feeling of happiness. You have been away for too long, my old friend. Welcome back, Traveler’s Zen. After a short ride the trees thinned. Abruptly we fell into a very large clearing. Large swathes of white Edeiweiss swam among a carpet of purple blooms and green grass. In the center stood an enormous ancient guardian. It was a giant Banyan tree, the roots too numerous to count, the age impossible to guess. Its many branches sprang up to the sky in offering, its many roots plunged into the ground like conduits to another world. It connected this world with those above and below. 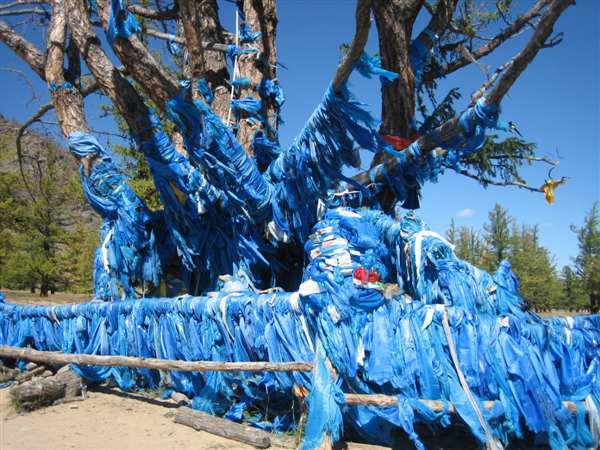 Strung around the tree were the traditional Shaman streamers of white and blue. Smaller trees, also festooned in streamers, stood watch in a ring. It was all a massive ovoo. The spiritual defender of the village I was leaving, and for those who made an offering, the protector of the traveler. I hitched Rocky to a tree at the outskirts of the clearing and approached the Banyan. What should I do? I knew from Toroo there were some prayers to be made, then 3 counter-clockwise circumambulations, followed by a final prayer. I stood before the tree and bowed my head, feeling simultaneously stupid and nervous. I muttered. God. Idiot. That was a stupid thing to say. 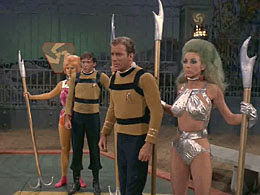 Who am I, Captain Kirk greeting the hot babes of Triskelion? That last part actually sounded pretty good. Nice. I looked up, then started walking around the tree. After the 3 circles, I stopped and faced the tree again. Going poorly. Better wrap it up. I think I was supposed to make an offering, but as I looked around, I didn’t see any bottles of vodka or the usual gifts. Perhaps this ovoo was recycle-conscious. So, I simply turned and walked away, feeling very odd about the whole experience. Hopefully, it’s the thought that counts.